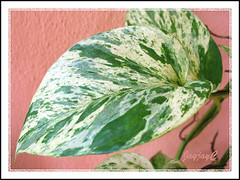 A top favorite house plant, worldwide! 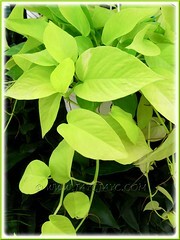 Money Plant, another of its common name, always ignites fond memories for me. As far back as a teenager, I had loved placing a glass of ‘Jade Pothos’ on my desk and later, a vase of either ‘Golden Pothos’ or ‘Marble Queen’, two lovely variegated ones, frequently adorned my office table right until my retirement. Very durable, long-lasting and seemed forever happy just sitting in a vase of water! According to the NASA/ALCA study on the use of common indoor plants for indoor air purification, Golden Pothos is one of the top 3 plants besides Philodendron and Spider Plant that has been labeled the most effective in removing formaldehyde. It has been found effective in removing benzene and carbon monoxide too. 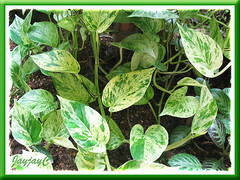 Plant type: Ornamental foliage plant or liana, native to Malaysia, Indonesia, New Guinea and Solomon Islands. Features: E. aureum, a vigorous grower, is a tropical vine that can reach varying heights or scramble on ground, rapidly and densely covering a wide area. Outdoors, on ground and if unrestricted in the wild, this liana can grow quickly up trunks of huge trees by attaching its aerial roots to their surfaces, reaching 10-20 meters tall. And, producing gigantic mature pinnatifid leaves up to 1m long and 45cm wide, though typically smaller, especially the heart-shaped juvenile leaves. The higher it climbs, the larger the top leaves grow. 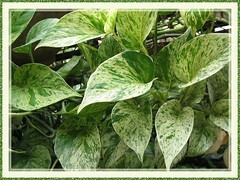 However, in cultivation, this popular houseplant with several named cultivars, is very much restrained. It can reach up to 2m or more if given suitable support to climb or allowed to cascade down a hanging basket or from a pot on a pedestal or shelf. If allowed to trail on ground, it can quickly cover a large area. Leaves sizes are smaller, generally varying between 7.5-20cm in length but longer if grown on ground or under favourable conditions. 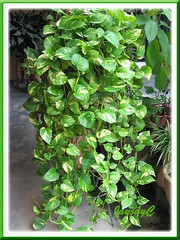 Its evergreen and waxy leaves are heart-shaped, alternate and simple, with singe solid colors of green like the ‘Jade Pothos’ or lemon-green as the ‘Neon Pothos’. Others are beautifully variegated with white, cream, yellow and various shades of green, such as the named cultivars below. Colors, variegation and sizes of foliage are extremely variable, changing according to the lighting conditions and other cultural factors. In the wild, E. aureum produces white flowers in a spadix that is surrounded by a spathe like plants in the aroid family, but hardly does in cultivation. All parts of this plant is poisonous with toxic calcium oxalate crystals, but toxic only if large quantities are eaten, resulting in severe pain in the mouth. Culture (Care): Being robust and hardy, E. aureum is one of the easiest plant to grow. It requires little care and very tolerable of neglect and abuse. Light: Bright light or filtered sunlight for best leaf coloration and growth. A few hours of morning sun is very ideal but avoid scorching sunshine. It can take low light to full shade but leaves become smaller, colors and variegation fade, becoming more green and less attractive. Moisture: Require medium water regularly, allowing the surface to dry out between each watering. Beware of over-watering that can cause rotting stems and yellowing/falling leaves. Dry air or underwatering can result in brown patches on the leaf and its margins, so increase watering and humidity by misting. Soil: Best in any humus or organic-enriched potting mix that holds moisture, yet well-drained and well-aerated. Nonetheless, any kind of well-drained soil will do. Others: Feed with a general liquid houseplant fertilizer once monthly when actively growing and less when inactive. Prune frequently to control growth and maintain shape. Trim any stems to just above a healthy leaf (or way back, leaving just a couple of nodes) and new shoots will soon appear forming more stems to make the plant fuller. 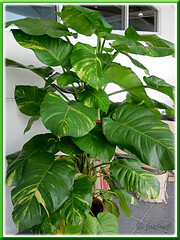 Wipe the leaves of houseplants regularly with a soft damp cloth to remove dust and keep healthy. Mist foliage occasionally if necessary to increase humidity or stand smaller pots on a tray of pebbles half-filled with water. No serious pests or diseases. May encounter problems with scale, mites and mealy-bugs though rarely. For temperate regions: Hardiness: USDA Zone 10-11. 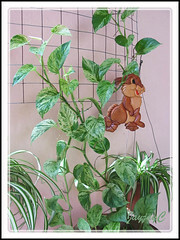 Check Dave’s Garden and read what other Pothos’ lovers have to say! Propagation: Propagated by tip cuttings or stem cuttings that root easily in soil or water. Take a healthy 3-4-inch long tip cutting with at least 4 leaves including the terminal buds from the current season’s growth, cutting it just below the leaf joint. Then cut off the basal leaves before inserting the cutting into potting soil or water to root. Another quick and easy method of propagation is layering which the plant does naturally too wherever its stems touch the soil, especially if grown as a groundcover. To propagate, just trim the stems into sections (preferably, each stem-section cutting should have a rooted node below and at least 1-2 nodes above), dig out and pot them individually in fresh soil to continue growing with least fuss. Learn more about propagation by cuttings, layering and division at Virginia Cooperative Extension. Usage: Because of its tolerance of low-light conditions, this easy-growing and hardy plant, E. aureum make excellent house plants in vases, pots and hanging baskets, allowing the stems to tumble down. 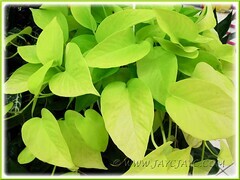 Ideal as an indoor plant in greenhouse or conservatory in temperate regions. 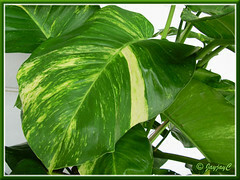 Its fabulous variegated foliage are used popularly for interiorscape in homes, offices, shopping malls and public places, as well as cut foliage to complement floral arrangement, while at the same time, cleansing the indoor air of pollutants. 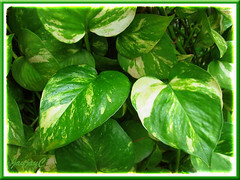 Outdoors, Pothos is most suitable as a groundcover in garden beds and borders with its sprawling habit, or grown in above-ground planter or small to large containers raised on a pedestal for a cascading effect. 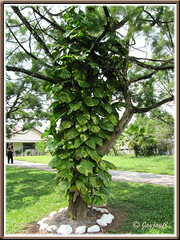 Very suitable as a climbing vine on trellis, poles, fences, trees or wires. It can also be espaliered against the wall for landscapping or allowed to cascade down a wall for that something extra to spruce and beautify your garden. 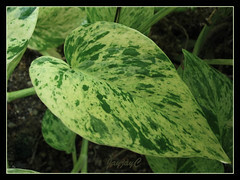 ‘N’ Joy’ – rippled or bumpy leaf texture, with randomly mottled leaves in white and green. I want to buy silver vine Money Plants seeds. Please mail me the website……where i can buy…….??? Your internet site is particularly beneficial. Thank you relating to offering lots of valuable content. We’ve book marked your weblog post web web page and are undoubtedly returning. When again, My partner and i get pleasure from your function and also offering a whole lot vital tricks for the future prospect. Hi, it’s me again. 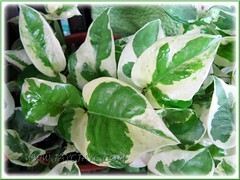 I love the variegated variety one, as above where can i buy this? Is this the type that grows straight up? Hi Peter! I’m sure you can get these common plants in any of your local nursery. 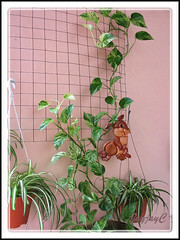 Pothos is very versatile, you can train them to climb up and just let them fall downwards from a high pot stand or sprawl on the ground. 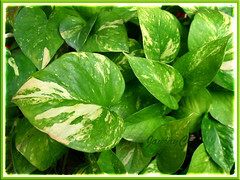 n joy any neon money plants are very nice,i want to buy. Sorry, Dr. Manish…. we’re not a retail nursery.